Home » thinking » Do you understand the gospel? Do you know what the gospel is all about – do you understand it well? 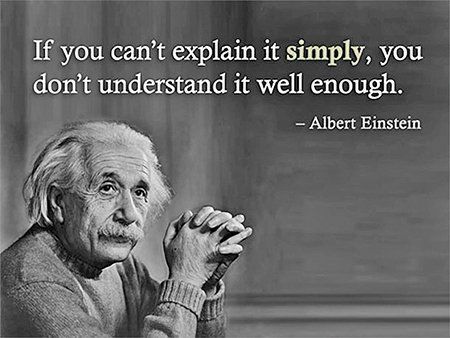 I’m not sure if Einstein actually made the assertion that, “If you can’t explain it simply, you don’t understand it well enough”, but I do know that RC Sproul said something similar suggesting that sometimes the only way that you could fully grasp a doctrine was to prepare to teach on it. The gospel is called the ‘good news’ because it addresses the most serious problem that you and I have as human beings, and that problem is simply this: God is holy and He is just, and I’m not. And at the end of my life, I’m going to stand before a just and holy God, and I’ll be judged. And I’ll be judged either on the basis of my own righteousness, or lack of it – or the righteousness of another. The good news of the gospel is that Jesus lived a life of perfect righteousness, of perfect obedience to God, not for His own well-being but for His people. He has done for me what I couldn’t possibly do for myself. But not only has He lived that life of perfect obedience, He offered Himself as a perfect sacrifice to satisfy the justice and the righteousness of God. It is without doubt, the greatest news we could ever receive. The Greek term “gospel” (ev-angelion) in Paul’s day distinguished the Christian message from that of other religions. An ‘ev-angel’ was news of a great historical event, such as a victory in war or the ascension of a new king, that changed the listeners’ condition and required a response from the listener. The gospel is news of what God has done to reach us – it is not advice about what we must do to reach God. It’s God’s initiative! God reached out to us whilst our back’s were turned! God has entered the world in Jesus Christ (fully God and fully man) to achieve a salvation that we could not achieve for ourselves which now converts and transforms individuals, forming them into a new humanity, and eventually will renew the whole world and all creation. This is the ‘good news’—the gospel. The gospel is the good news of gracious acceptance. Jesus lived the life we should live. He also paid the penalty we owe for the rebellious life we do live. He did this in our place (Isaiah 53:4-10; 2 Cor 5:21; Mark 10:45). We are not reconciled to God through our efforts, but through his efforts alone. When we trust in Christ for our acceptance with God, rather than in their own moral character, commitment, or performance we are simultaneously sinful – yet accepted. We are more flawed and sinful than we ever dared believe, yet we are more loved and accepted than we ever dared hope at the same time. Of course, God’s grace leads me to the place where i don’t want to do the things that displease Him, and that is yet another way we see the power of the gospel – the gospel has power to change us from the inside out. A lack of deep belief in the gospel is the main cause of spiritual deadness, fear, and pride in Christians, because our hearts continue to act on the basis “I obey, therefore, I am accepted.” If we fail to forgive others–that is not simply a lack of obedience, but a failure to believe we are saved by grace, too. If we lie in order to cover up a mistake–that is not simply a lack of obedience, but a failure to find our acceptance in God rather than in human approval. So we do not ‘get saved’ by believing the gospel and then ‘grow’ by trying hard to live according to Biblical principles. Believing the gospel is not only the way to meet God, but also the way to grow into him. The gospel is the good news of changed lives. Paul says to Christians, ‘your life is hid with “Christ in God’ (Col 3:3), and in numerous places he says that we are now ‘in on the one hand, that the Father accepts us in Christ and treats us as if we had done all that Jesus has done (cf. Col 3:2a). But this is also means Christ’s life comes into us by the Spirit and shapes us into a new kind of person. The gospel is not just a truth about us that we affirm with our minds, it is also a reality we must experience in our hearts and souls. An example of this is seen in 2 Corinthians 8:9 where Paul wants the people to give an offering to the poor. He says, “I don’t want to order you. I don’t want this offering to simply be the response to my demand.” He doesn’t put pressure directly on the will (saying ‘I’m an apostle and this is your duty to me!’) nor pressure directly on the emotions (telling them stories about how much the poor are suffering and how much more they have than the sufferers). So the solution to stinginess is to focus on the generosity of Christ in the gospel, where he poured out his wealth for you. Now you don’t have to worry about money—the cross proves God’s care for you and gives you security. Now you don’t have to envy any one else’s money. Jesus’ love and salvation confers on you a much more remarkable status—one that money cannot give you. This is just grace upon grace. Faith in the gospel re-structures our motivations, our self-understanding and identity, and our view of the world. Behavioral compliance to rules without heart-change will always prove to be superficial and fleeting. The gospel changes your heart. The gospel is the good news of the new world coming. The gospel then, is not just about individual happiness and fulfillment. It is not just a wonderful plan for ‘my life’ but a wonderful plan for the world. God’s world. Christ wins our salvation through losing, achieves power through weakness and service, and comes to wealth via giving all away. Those who receive his salvation are not the strong and accomplished but those who admit that they are weak and lost. This pattern creates an ‘alternate kingdom’ or ‘city’ (Matt.5:14-16). in which there is a complete reversal of the values of the world with regard to power, recognition, status, and wealth. When we understand that we are saved by sheer grace through Christ, we stop seeking salvation in these things. The gospel at its very least, creates a people with a whole alternative lifestyle and agenda. Racial and class superiority, accrual of money and power at the expense of others, yearning for popularity and recognition–all these things are marks of living in the world, and are the opposite of the mindset of the kingdom (Luke 6:20-26). Paul put it so well when he said that he was not ashamed of the gospel because it is the power of God unto salvation. We underestimate the power of the gospel. Don’t pray for people to have dreams about Jesus, that is outside of the anything taught in scripture! Instead, pray a prayer that God will be happy to answer – that the gospel will have free reign and fruitfulness in the life of the unbeliever. The gospel is the news that Jesus Christ died and rose for our salvation in history. It is the power of God unto salvation. The gospel is a transforming grace that changes our hearts and inmost motives, it is the power of God unto salvation. The gospel brings a new ‘order’ in which believers no longer are controlled by material goods or worldly status and have solidarity with others across customary social barriers, it is the power of God unto salvation. Do we really understand what the gospel is all about? I doubt it. It is a vast wealth of treasure and discovery, and probably the very reason that he sometimes gives people long lives for. Discovery.